At Function and Form Autolife, we approach our products with a unique mindset. We look at the functionality of each product in its intended and common use. Not always in a traditional approach, but more importantly in how our consumers use and need these products in todays times. With our Lug Nuts we not only considered durability from fading in using powder coating finishes, we also added bright and bold colors to match your unique character in your vehicle. We saw a need for customers to make their cars ride lower or retain shock travel at their desired height, which lead us to create extended top mounts. Some of our customers were hitting the track, so we made high quality performance springs for our coil-overs. These allowed our customers to fine tune their set up more, and true to our character we made sure they came in unique colors. The TYPE ONE coil-over is a full bodied coil-over with simplicity in mind. We set the dampening characteristics for you and also chose less aggressive spring rates to match the fixed dampening. What we did not change was the durability, quality, smoothness of ride and lowering characteristics we are known for. 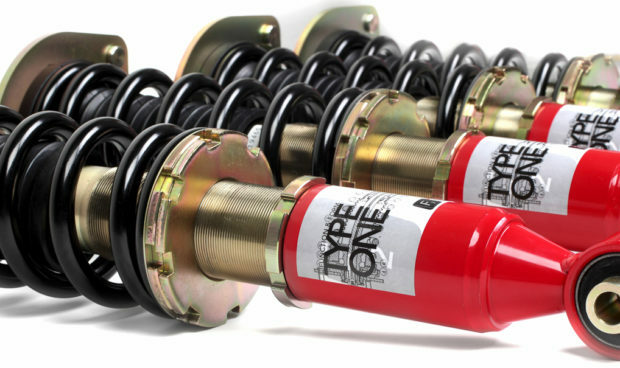 Continuing with our belief that quality can be affordable, we priced the TYPE ONE suspension to fit the financially conscious tuner’s budget. We recommend for the TYPE ONE product line for anybody that wants to enjoy performance, quality and great looks in a simplistic way. Install, set your height, and you are ready to roll! Don’t let simplicity fool you. 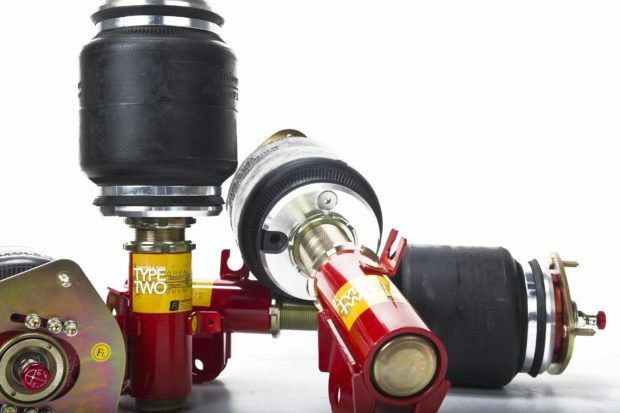 The TYPE ONE suspension system is constructed with the same materials as our TYPE TWO systems. We used the same approach and philosophy in construction and strength. Our main goal is to give you a peace of mind when commuting or cruising on the weekend. The TYPE TWO coil-over is our adjustable dampening system. More aggressive than the TYPE ONE, we aimed to make it the ultimate street inspired coil-over. Our philosophy was a coil-over designed for street durability, comfort, and style but can endure the occasional track days. (Especially with recommended, FPS springs upgrade). A lot of our customers dream of hitting the track but the reality is they want to enjoy their pride and joy on the streets as well. A dedicated track car is not a choice for many but that’s ok. We designed a suspension that can let you enjoy the streets or an occasional fling on the track. You pick. In achieving this, we wanted to make a stronger product to endure the imperfections of the real world. Steel materials have been used for the lower mounts to give the shocks OEM durability. Spring rates are slightly more aggressive than a TYPE ONE, to handle occasional track duties and spirited street driving (although we always suggest safe and smart driving on public roads). Yet this did not sacrifice ride quality. Monotube shocks are used allowing for more piston surface area, and heat dissipation. Our goal is to offer you a suspension that can handle the wear and tear of daily driving duties. With the TYPE TWO’s 32 levels of dampening adjustment, you can dial in ride and handling characteristics for the street or the track, giving you ultimate versatility. 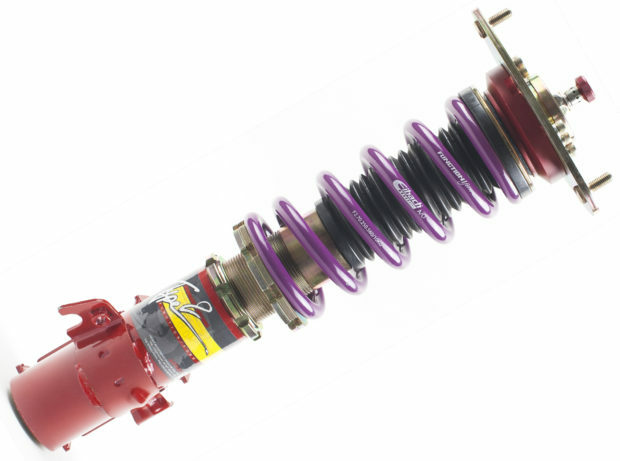 Do you have Function and Form coil-overs and want to go from static to air ride? Maybe you like the idea of air, but not sure if its the long term solution for you? Introducing Function ONAIR. Our kits are designed to where no cutting, welding or trimming is required to convert the coil-over to an air bag strut. This means the modification is fully reversible. This also means you can purchase our TYPE TWO or TYPE ONE coil-over system with plans to convert to air-ride in the future offering a 2-in-1 capability. This can work within a limited starting budget or give you options to convert in the future if you cannot decide which route you want to go. With your ONAIR Conversion Kit you are provided with the single bellow bags and brackets required to replace the springs on your coil-over system with air bags that allow for an adjustable height. Aero Sport bags offer better performance and handling by providing you with an adjustable spring rate. We took out the guess work on converting a Function and Form set to an air ride. No modifications are needed to the existing springs or perches on the coil-overs. Swap those out and save them for later in case you want to convert back to a conventional coil-over. All components of these coil-overs are single part replaceable too. So no need to panic about total kit replacement if something goes out. Now that you have the strut part covered, you have the option to pick the rest of your air management system that fits your needs and budget. Interested in selling Function and Form Autolife? You should be! You can easily add it to your RPMWare website. Login to your RPMWare account and click the Product Catalog tab. Scroll down to the F‘s and click Function and Form Autolife to open it up. Click the Activate It link to the left and you’re done. Note: it will take 3-5 minutes for your catalog to rebuild before Function and Form Autolife is published to your site. While you are in there, make sure you set your pricing. Phone Number: 626.407.0015 – Ask for Andrew!